We’ve known Doug Appeldoorn for years. I think the first time we met him we was running a beer and chocolate pairing. He taught us how fantastic beer was to pair with food and that in many ways it was better for pairing than wine. Fast forward a bit and he has become a friend in the industry that we now know is a prominent figure in the home brewing scene that has done everything he can to promote the wonderful world of brewing. When he told us he was planning to open a brewery of his own we were insanely excited. It became even more exciting when it was announced that it would be at the location of the former Junction Craft Brewing. 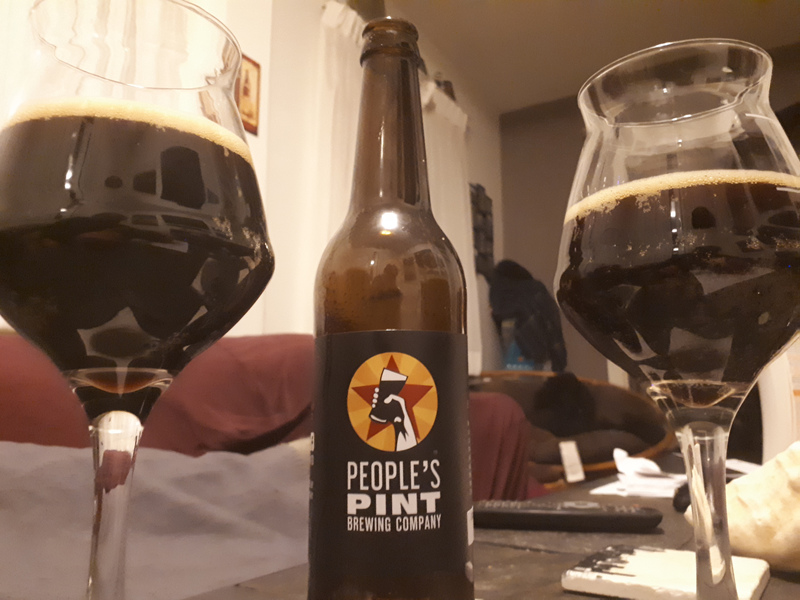 Recently we visited The People’s Pint during their soft opening and were blown away. Today though – I want to focus on one of their very first beers: El Chupacabra. A cinnamon infused porter. I tried this beer while sitting under a massive version of the People’s Pint logo and petting a very friendly dog. I had it as part of a flight and when I first tasted it I was hooked and had to have a full sized glass. The beer is only available at the brewery for now and sits at 5% ABV. As mentioned, being big on the home brewing scene, you can actually brew this beer yourself by buying the kit here. Appearance: Short lived tan head. Black otherwise. Aroma: Old coffee, 90% coco chocolate and the cinnamon of course. Taste: Lighter than expected mouth feel. The coffee is gone but chocolate with cinnamon come in well. Aftertaste: The coffee comes back with a vengeance. Overall: A fantastic flavoured beer. Pair with cinnamon rolls or cheese cake, not chocolate though. Also, BOBKA.